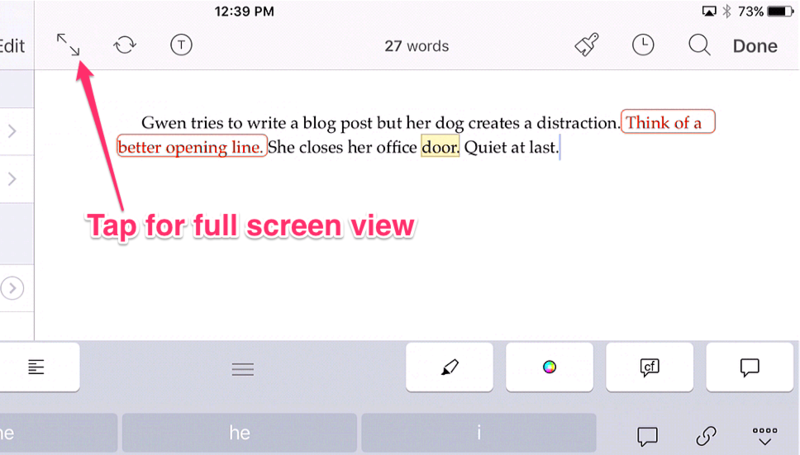 Whether you’re stuck with a desktop computer, or don’t want to lug your laptop around, Scrivener for iOS can set you free. Since I expect many of you will be using it to lay down words for NaNoWriMo this year, here’s how to use my favorite features for NaNo (as covered in last week’s post for Mac and Windows) in Scrivener for iOS. A few things to keep in mind about the iOS version. If you return to the Projects list, you are closing the project you were working in. Unlike the Mac and Windows versions, you can only have one project open at a time. If you plan to work on both iOS and a Mac or PC, you need a Dropbox account (if you use this referral link, we both get an extra 500MB of storage) and must install Dropbox on all the computers/devices you plan to use with Scrivener. Then, move any laptop/desktop projects you want to work on into the correct Dropbox folder before you begin. If necessary, sync your projects before you start writing. Remember that when you finish working on a project on your iOS device, you must tap the sync button on the Projects page (see below) before trying to open the project on another computer. Likewise, ensure that a project on your desktop/laptop has synced to Dropbox before trying to open it on your iPad or iPhone. If you don’t have Internet access, syncing won’t happen! I recommend creating an Ideas document to store thoughts you have about future scenes, and a Change Log to keep track of changes you want to make to existing scenes. Both of these can ensure you don't lose any fabulous ideas, while staying on track with your writing. Navigate to the high-level view of your project’s Binder (the header at the top of the Binder should display your project name, not the name of a folder). 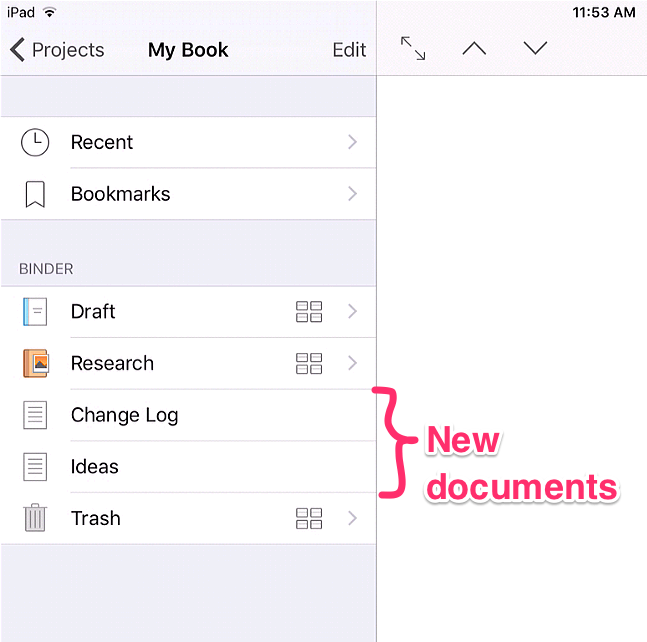 Tap the + button at the bottom of the Binder, give the file a name, and tap Add. The new document appears at the bottom of the Binder (see image below). Tap the Edit button at the top of the Binder (see above). 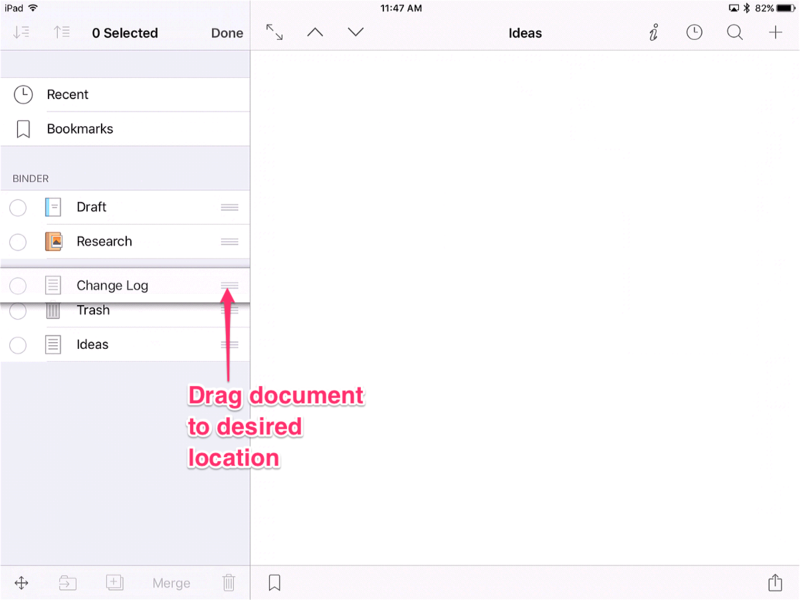 Drag (tap and hold, then drag) the file to the desired location within the Binder, as shown below. When done moving files, tap Done. Don’t let yourself get stuck or distracted when you can’t think of the perfect analogy, or know you need to do more research. 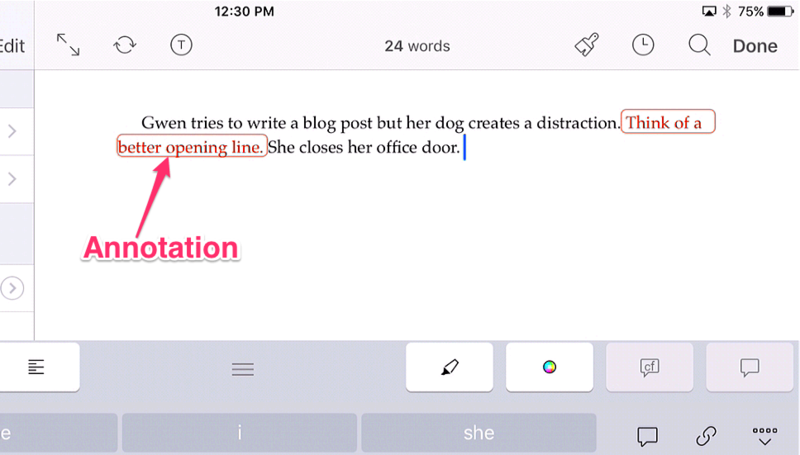 The iOS version allows you to use annotations or comments to make notes for yourself so you can get back to writing. Here’s how. 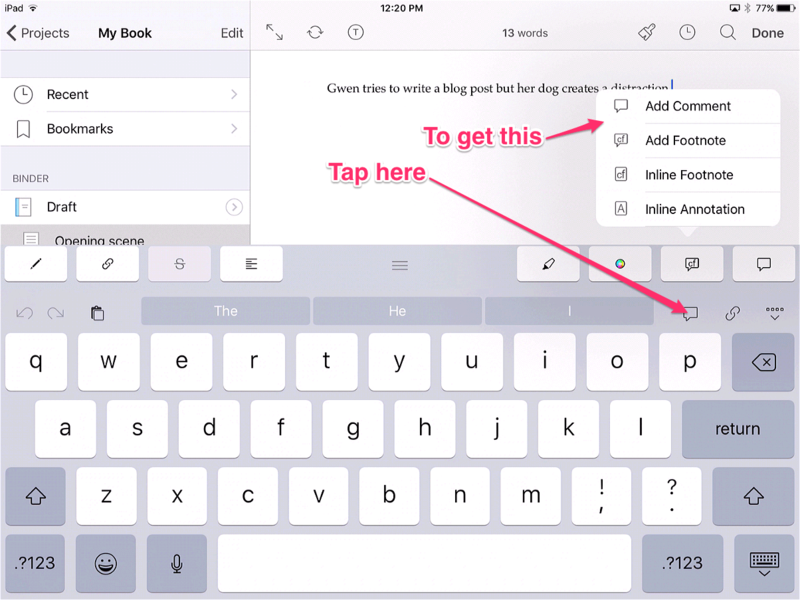 Tap the comment bubble button in the predictive text row (shown below) to get a submenu of options and choose Add Comment or Inline Annotation. NOTE: For comments, your cursor must be next to text for the option to be available. Also, you can tap the comment bubble button in the extended keyboard (the row of buttons above the predictive text row) for quicker access to comments, but you may have to swipe left or right to see it. Type your annotation or comment. 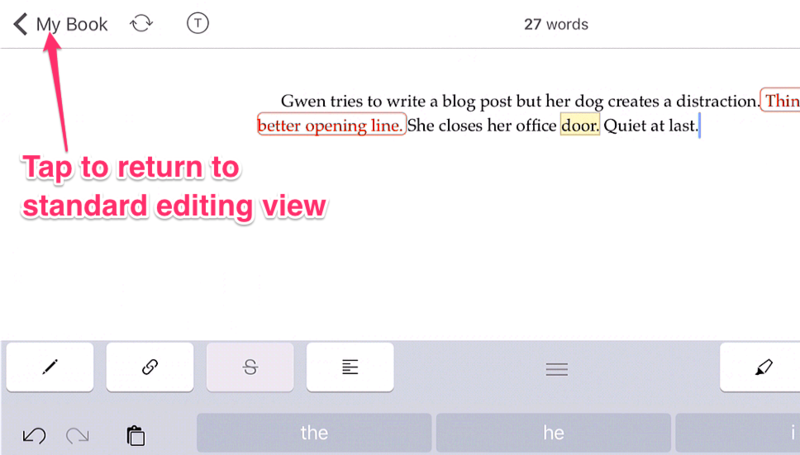 For annotations, repeat step 1 to turn off and return to standard text. To view a comment, double tap the highlighted word. 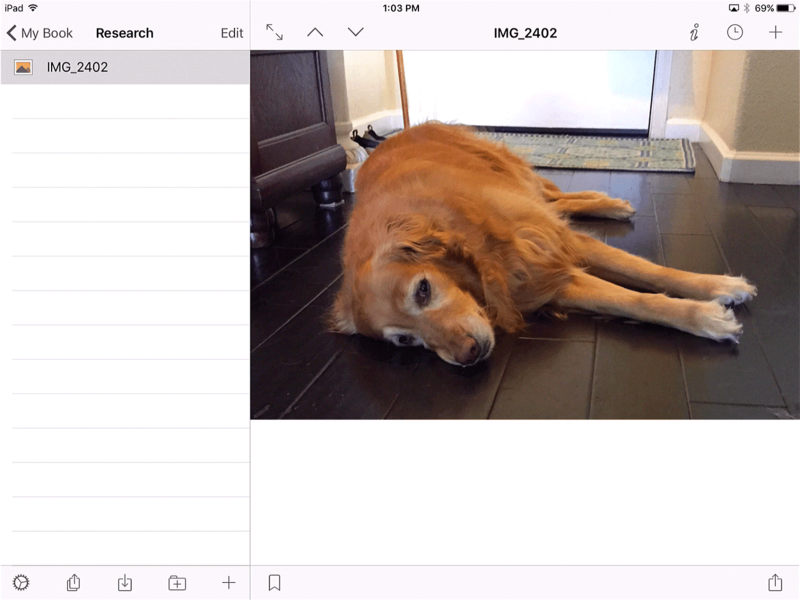 The iOS version doesn’t have the same full screen/composition mode that the Mac and Windows versions have, but you can hide the Binder and work only with your text. Tap the Full Screen button at the top of the Editor. To view the Binder again, tap the name of your project in the upper left corner. 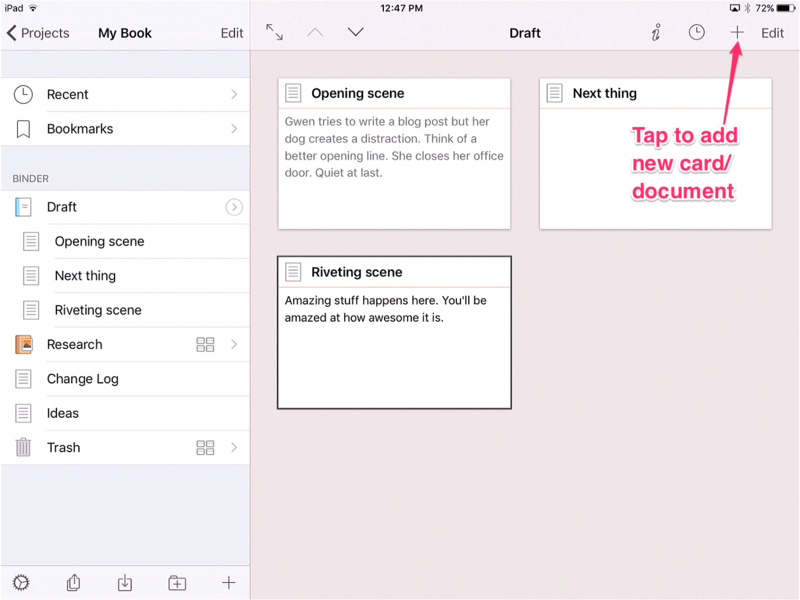 Plotters: Create your scene documents beforehand either in the Binder or the Corkboard. If you like to plot using index cards, then do the following. Select the Draft (aka Manuscript) folder. Tap the + in the upper right corner to create a new card. Title it, add a brief synopsis of the scene, if desired. Pantsers: Show up on day one, select the Draft folder, create a blank document and start writing. Repeat. Here’s how to group documents into chapter folders. In the Binder, tap the Edit button at the top. The button changes to Done. Tap the circles to the left of the desired documents to select them. Tap the Move button at the bottom of the Binder (see above) and choose Move into New Folder. Tap Done at the top of the Binder to exit Edit mode. Tap and hold the New Folder to get the Inspector so you can rename it, then tap Done. 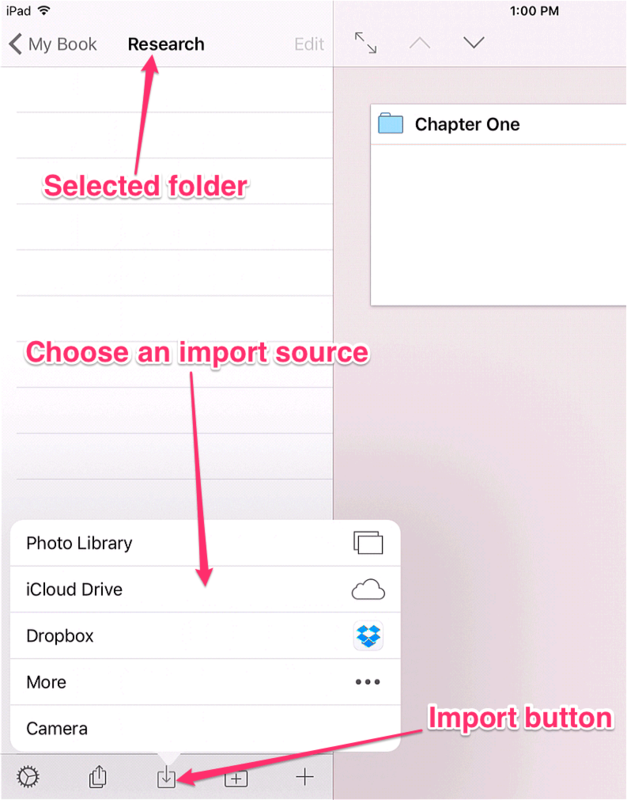 Though importing is generally best done while on your Mac or PC, you can import files in the iOS version. This works for both research and text with the same rules as Scrivener for Mac and Windows (no images, PDFs, or other non text-type files in the Draft folder). 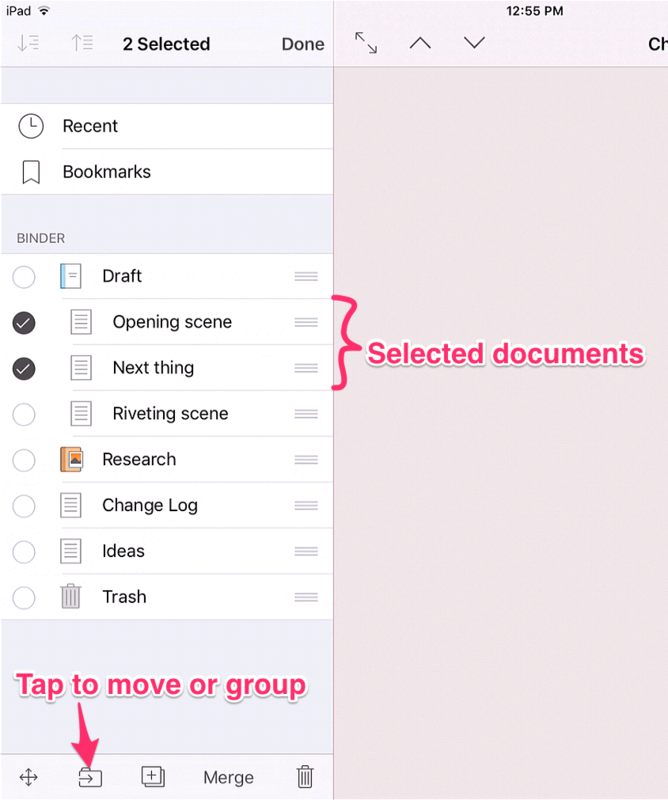 Select the desired folder (outside of the Draft/Manuscript folder) and tap the Import button at the bottom of the Binder. Choose the source for your imported file—yes, you can even choose Camera and take a picture of something!—and select the desired file. Your goal is 50,000 words. 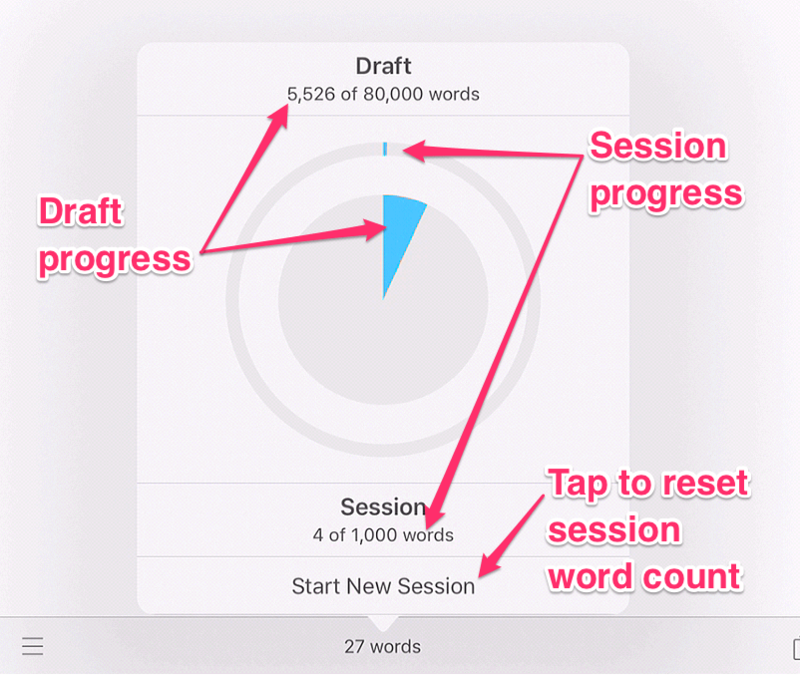 Scrivener makes it easy to track your progress, even in iOS. Maybe even easier. As with the original, you can set a target for the entire manuscript, as well as one for each writing session. Tap the word count at the bottom of the screen. 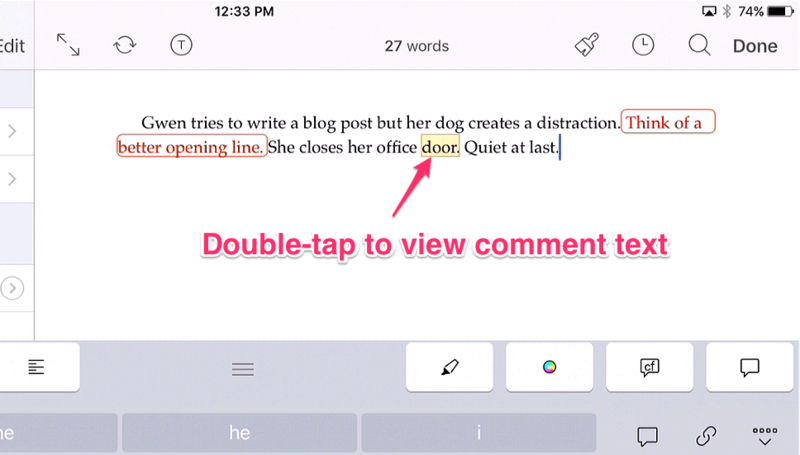 NOTE: If you’ve tapped inside the document and entered edit mode, the word count will be at the top of the screen. 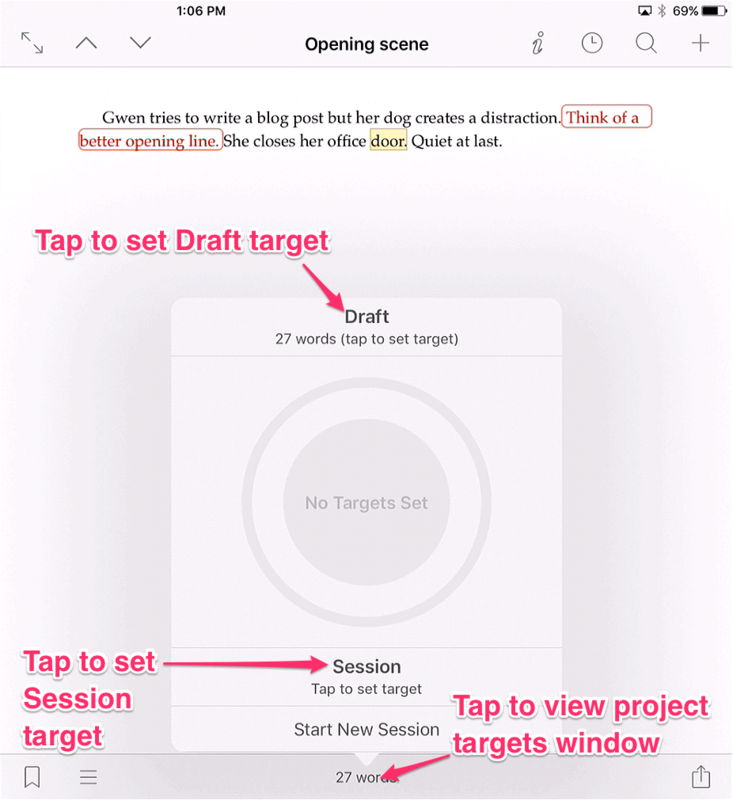 Tap the word Draft to set a manuscript target and use the spinner to select your goal. Tap Targets to return to the main Project Targets window. Tap Session to set a session target. 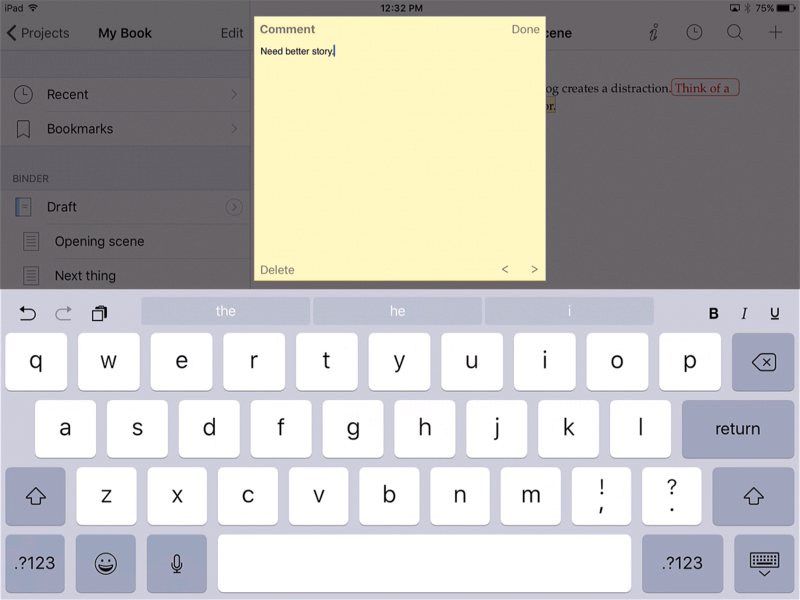 Tap Start New Session to reset the Session word count (your progress) to zero. Whether you’re using Scrivener for iOS for NaNoWriMo, or just to be untethered from your computer, have fun with it and enjoy your newfound freedom! Want more help with Scrivener? Sign up for an online class, read more Scrivener articles, or schedule a private training session. I don’t know if I’ll be using my ipad for NaNo or not, but your explanations and screen shots are so helpful, Gwen. I”ve learned so much about using Scrivener from you – thanks! Thank you. Didn’t realize Scrivener was now on iOS. I went to my iPad and downloaded it. Forgot to go through your link here so missed both of us getting the 500 MB additional storage. Sorry about that, indeed, but I do love Scrivener, although pretty new to it. Will enjoy your site for insights. I’m a newbie writer. Hi, Marylou. Pretty cool, right? No worries on Dropbox. Maybe you can find another friend to refer to so you get the extra storage. 🙂 Hope the writing goes well! Hi Gwen, Thank your for the article. Happy to contribute to your Pantry!- and I loved the pic of the Goldie. I have a problem with my Scrivener and can you help? I do not have a computer but I do have an ipad with Scrivener on it. I am in a mess. I wrote 70K of my novel on Google Docs (before I knew about Scrivener) and copy/pasted that into my ipad Scrivener – some of my chapters have different types of fonts and different size of fonts from google docs – some even have 5 space indents and 10 space indents. I have written 30K more words in Scrivener – messing with their fonts and sizes just because I didn’t understand them. Hi, Lois. What I would do is set up some of the text in one of your documents exactly the way you want it for all of them (or if you already have this great). Tap the Editor to put your cursor in that correctly formatted text and then tap the paintbrush icon in the header. Tap Formatting Options and choose Set as Default Formatting. This tells Scrivener what you want your new documents to look like when you create a blank one. 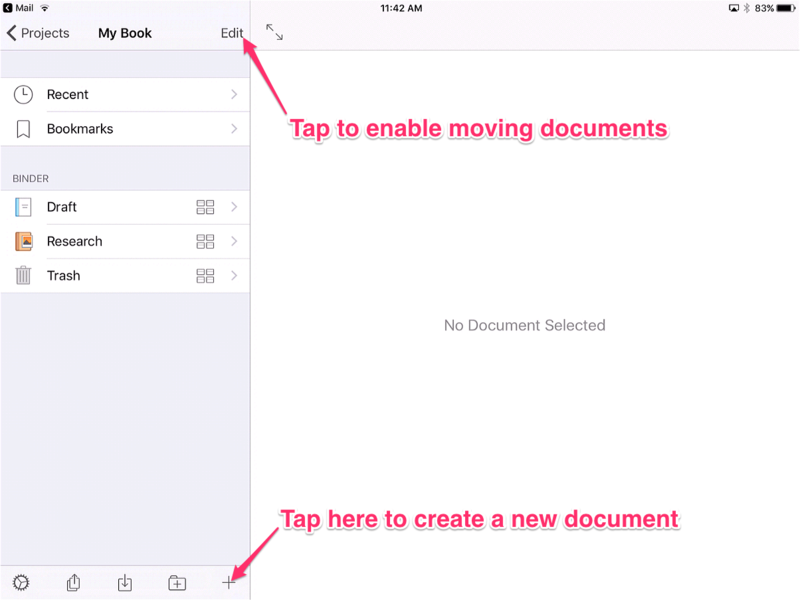 Now, for each document you want to change, select it in the Binder and tap in the text, then repeat the steps above, but choose Use Default Formatting under the Formatting Options. That will apply the default you created to the current document. It might take a bit of time to go through each one, but they’ll be all cleaned up when you’re done. In the future, if you copy/paste or import a document, you can do this right away. Thanks for the pantry donation! I really appreciate it. 🙂 I hope this helps. Thank you Gwen for your help. I have paid for the Udemy course you recommended by Steve. I appreciate your kindness.